albert einstein is said to have said: "If the honeybee becomes extinct, mankind will follow within four years." The physicist wasn't entirely off the mark--provided he did make this comment, which is reproduced worldwide by apiculture lobbyists, though there is no evidence to show that Einstein actually made this statement. Honeybees (Apis mellifera to the zoologically inclined) have not gone extinct. Not yet, anyway. Their populations are declining sharply (while humans continue to reproduce prolifically). Fewer honeybees means not just less honey but also less food--just in the us, honeybees are critical to pollinating up to 95 crops. Commercial beekeepers and scientists are a worried lot. The latest decline in the us was noticed in late 2006 in Florida. Official estimates say about 30-90 per cent of bee colonies got mysteriously wiped out. "The queen bee usually remained in the hives surrounded by untended brood, while others abandoned," says Diana Cox-Foster, entomologist at the Pennsylvania State University. Mite bee irresistible The phenomenon has been observed in wild bee colonies. In 1987, the varroa mite, an external parasite that attacks honeybees and feeds on them, destroyed most wild honeybee colonies in the us. But the mite (Varroa jacobsoni) had not affected commercial apiaries. Not till it acquired resistance to insecticides and started attacking domesticated bees. There came a new term (and acronym) for it: colony collapse disorder (ccd, just in case you didn't get it). A variety of pathogens are known to infest the bee colonies. To control these, beekeepers use chemicals, which might be also affecting the bees. Low doses of nicotine-based chemicals, used in seed dressing for horticultural crops, affect the bees' navigation skills. High doses of the insecticide imidacloprid, used to treat sunflower seeds, also affect them. After 40 per cent of its bee colonies were destroyed in 1999, France banned imidacloprid. Bad practice Modern beekeeping practices have put honeybees at risk. In regions like California, large-scale commercial beekeeping has seen a new trend. Beekeepers are paid to transport modern hives from field to field for pollinating crops. But this causes migration stress among bees. "Beekeepers rent about a million bee colonies to pollinate about half-a-million acre of plantations. 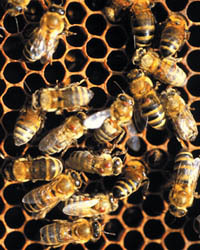 Such high density creates competitive stress for bee colonies," says Marla Spivak of the University of Minnesota, usa. Hive stress also weakens the bees' immune systems. Beekeepers often artificially feed bees with high-fructose sugar syrup, which is unhealthy. Setback time Of all pollination by insects, honeybees contribute about 80 per cent. The mysterious deaths of bees in the us come at the heels of similar reports from Canada, the uk, and some parts of Europe and Southeast Asia. The diversity of bees (not necessarily honeybees) has already declined significantly in Britain and the Netherlands (see 'Alarm buzz', Down To Earth, Aug 31, 2006). Ten years ago, India faced a similar decline, which was later linked to a viral disease. After coffee growers complained of crop failure this year, scientists are studying the native honeybee (Apis cerana). "Coffee heavily depends on honeybees for pollination. We are looking at all aspects related to the crop failure, along with the chances of honeybee decline," says M Soubadra Devy, fellow of the Ashoka Trust for Research in Ecology and the Environment, a Bangalore-based ngo. Scientists are yet to figure out the exact cause of the problem. Just the international pollination industry is worth us $ 40 to 100 billion. What is also at stake is the world's honey and food crops.